A Personal View of the Room: Are International Human Rights Universal? This is a burning ongoing debate whether international human rights are universal or not. International Human rights are the universal declaration of human right (UDHR) which has been adopted by UN General Assembly on 10 December 1948. It includes 30 articles to protect primarily civil/political rights as well as socio-economic and cultural rights. However, the questions rises whether these 30 rights are really universal or not? Some especially Asian and people from patriarchal societies argue that UDHR is just a way to impose western culture. In another word, UDHR is a Western concept of liberal individualism. For instance look at the cartoon below. It’s not just a cartoon but the real picture of patriarchal society. In a male dominated society, women are expected to be “loyal”, “silent”, “caring” and “soft” and follow what their husband asked them, thus they hesitate to revealed their identity to the public when they are raped or sexually abused or became the victims of domestic violence. 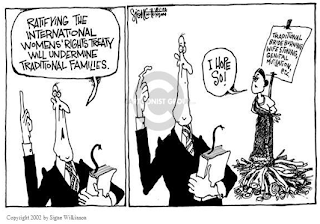 If you look at the left cartoon ( Cartoonist Group UDHR Interpretation)of traditional families, although the woman has gone through extremely awful experiences which also show the deprived from basic rights but when her husband says that ratifying international women’s rights treaty will undermine traditional families, she supports her husband and says I hope so. Therefore, UDHR standards ought to be interpreted differently in different cultural contexts. How can UDHR be universal if it not accepted by traditional family or patriarchal society or interpreted differently? On the other hand, some argues that UDHR is a way to balance the power. But again the question that pop up in my mind is whether is really balancing the power or not? There are the huge differences between universalism versus realism. If you compare these two(Anastasia and landsker) images, I have taken from internet. The left image shows that Human rights for all and we know that human rights are the rights we have simply because we are human. This is how institively human expect and deserve to be treated as a person but in reality see the right side image. Its just for certain powerful people and certain country. I don’t think that I need to explain more about this, we all are aware about it. When Nelson Mandela stood up for social justices in 1990, his country has already agreed to abolish such discrimination for almost 40 years but still he fought. Does Universalism means for some people? If human rights are for all, then why 35,615 people die from starvation every day? Why more than 800 million people in the world aremalnourished? Why almost 400 million people worldwide have died from hunger and poor sanitation? Why 925 million people are still hungry? Why billions of adults are unable to read? Why are 27 million people still in slave today? Now lets see another image (The Lancet Student) which I have taken from Internet again. According to the UDHR, Article 1, All human beings are born free and equal in dignity and rights…. 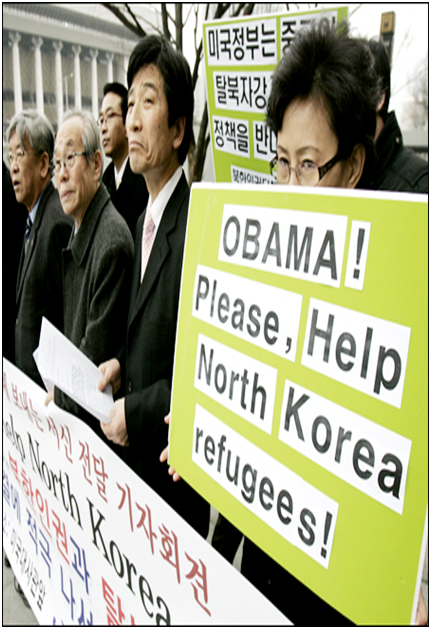 If this is the case than why should North Korea refugees and activists have to request US president Barack Obama to help them. Article 3, Everyone has the right to life, liberty and security of prson. How has North Korean people have life, liberty and security, given the facts that thousands of people in North Korean Jail are killed. The situation of North Korean whether in Jail or as an refugees also violate the UDHR article 5 No one shall be subjected to torture or to cruel, inhuman or degrading treatment or punishment. Here North Korea is just an example of many countries who has violated the UDHR. This is also example of how state power neglects human rights in the name of providing security or protecting citizens. How come it became universal? Human cruelty, the power of state, misunderstanding and frailty undermines human rights and make hopeless task of securing Human rights universally. If these are the case than can we really say that International Human Rights are universal? "Dignity and Justices for all of us." United Nations Development Programme. UN, n.d. Web. 27 Mar. 2011. <http://www.un.org/events/humanrights/udhr60/hrphotos/declaration%20_eng.pdf>. "The Three Top Sin of the Universe." Starvation.Net. N.p., 11 Sept. 2001. Web. 27 Apr. 2011. <http://www.starvation.net/>. Cassidy, Daniel J. SUNLIT UPLANDS. Blogger.com, n.d. Web. 27 Apr. 2011. <http://www.sunlituplands.org/2008/10/record-27-million-slaves-in-world-today.html>. Freeman, Michael. Human Rights: An Interdisciplinary approach. 2ndnd ed. Cambridge, UK: Polity Press, 2011. 1-235. Print. Hey! Great blog and great debate. Yes, yes, human rights seem to not be for all in many ways... They documents say they are universal but each country interprets them as they like sadly. Please keep up the good work thought! Great blog. WHAT ARE MILLENNIUM DEVELOPMENT GOALS?